Last year's group knew how to have fun! Did you know there is a ski bus in our neighborhood? 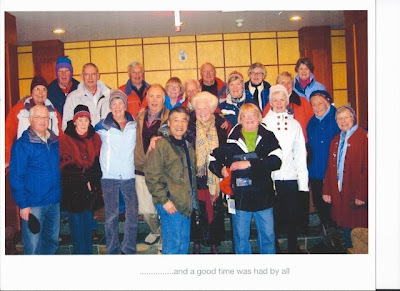 The Innis Arden Ski Club was started in the 1960’s. Its members are a group of vibrant, avid skiers of all skill levels who participate and work together to make ski trips easy, accessible and fun. The members come from all over the area; there are no club fees. Beginning in January the Innis Arden Ski Bus travels to Stevens Pass and Crystal Mountain on alternate Thursdays, for a total of eight trips. A first-class bus leaves from the Innis Arden Clubhouse at 7:00am and heads straight for the slopes, non-stop. On the trip home, the skiers relax and enjoy refreshments provided by the club. The bus returns to Innis Arden by approximately 6:00pm. Being a member allows skiers to take advantage of group rate lift tickets at a considerable discount. If you’re a skier looking for an easy and relaxed way to enjoy a day of skiing, or even if you’re a bit rusty and want to pick up your favorite sport once again, come join us. Skiers of all age groups and abilities are welcome! For more information contact Ida Callahan.